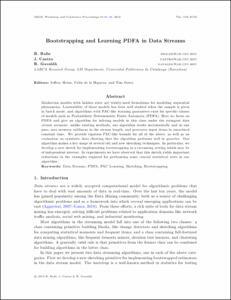 B. Balle; Castro, J.; Gavaldà, R.
B. Balle; Castro, J.; Gavaldà, R. Bootstrapping and learning PDFA in data streams. A: International Colloquim on Grammatical Inference. "Proceedings of the Eleventh International Conference on Grammatical Inference". Washington: 2012, p. 34-48.